This could be the hottest kids' movie ever made. Brad Pitt might be currently starring in the gritty Quentin Tarantino-directed "Inglourious Basterds," but the actor told Access Hollywood he'd welcome the idea of making a movie his children could see – and he wouldn't mind sharing the screen with partner Angelina Jolie. "It's outrageous!" Brad told Access' Maria Menounos on the red carpet of the "Basterds" Hollywood premier, referring to the World War II movie about a group of soldiers hunting Nazis. "Will [you] ever do a kids movie together, so that [your children] can enjoy something?" Maria asked Brad and Angelina, who both looked stunning in matching head-to-toe black ensembles. "I don't know… we'll see what comes up," he said. "We're open… we're open for anything." The father of six told Access his kids enjoyed him bringing his "Basterds" accent home from the set. "Actually, my son picked it up," he said of the Southern drawl he uses as Nazi hunter Lt. Aldo Raine. "He's pretty good at it, an Asian with a Tennessee accent, it's pretty fun!" 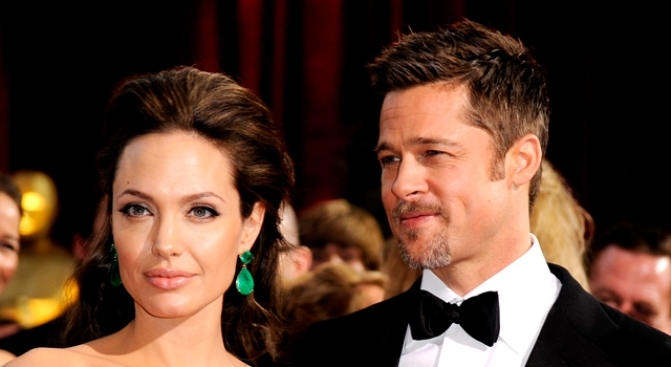 Angelina accompanied Brad to the Hollywood premiere of his new film, but let her man hoard the night's spotlight. "I'm letting him do interviews tonight," Angelina, who rocked a strapless black leather dress, told Access. "But, it's nice to be here!" "Inglourious Basterds" opens in theaters on August 21.